Affordable Accoutrements: The Unparalleled Versatility of Whiteness! The Unparalleled Versatility of Whiteness! I wasn't in the market for (yet) another set of dishes when I stopped by my favorite local thrift store on Saturday morning. I saw the box in the picture below. I quickly moved the dozen or so items piled on top of it and peered inside. I expected to see something other than pristine white dishes. I assumed there'd be clothing, toys, kitchen items, VHS tapes ... anyone's guess! It's a shop that sells abandoned items from storage units. Surprisingly, it held the original contents, still sealed with tape in unmarked boxes with cardboard dividers to protect the dishes. I asked the shop owner, "How much?" "Twenty dollars," was the reply. We chatted about nothing in particular for a few minutes. Then I began, "About those dishes ...," intending to ask the return policy. She smiled and said, "If you want 'em, you can have 'em for fifteen." How could I say NOT have taken them home? SO many dishes! What to do with them now? For me, the answer was obvious. I love setting formal tables with vintage crystal, silver flatware, a floral centerpiece, and lots of candles. White dishes are truly versatile. They can easily be substituted for expensive bone china. Another plus is that, regardless of the menu you've planned, any food looks its absolute best presented on simple white dinnerware. I'm using Fostoria's "Holly" glassware (1942-80). I love the crisp, stylized laurel decoraton and the graceful shape of the stems. Dogwood branches provide drama, with their organic textures, beautiful petals, and interesting shapes. They also repeat the whiteness of the dinnerware. Then there was a dilemma. What was I to do with all the remaining dishes? Another table perhaps. A far less formal table, set in the den ... bare tabletop, no chargers, stainless flatware, sturdy glasses, cups for coffee or tea. Well, perhaps we'll need tall flutes for something pink and bubbly. Floral print napkins will add a romantic touch. These are an easy-care blend. I purchased them a few seasons ago at Tuesday Morning. Peonies and azaleas are blooming in the garden. Their colors and shapes seem to me to be exotic, almost tropical. Like pink flamingos! Even though I wanted this to be the "dressed down" version of a table set with white dinnerware ... I couldn't stop myself from adding a touch of silver. 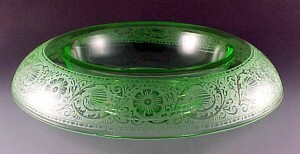 The vintage footed bowl (silverplated) is great for displaying fruit or flowers. The plating is worn on the inside so, when it's being used as a fruit bowl, a round porcelain vegetable bowl acts as a liner. These saucers can do double duty. I used them as bread plates on the more formal table in the dining room. The water glasses are Imperal's "Cape Cod" (1932-84). I bought the champagne flutes at a consignment shop. Readers often comment on the oil painting over the fireplace. My friend, Yvonne, painted a rose from her garden with bold strokes of a palette knife. Yvonne also did the pastel painting of a crepe myrtle in bloom. It normally hangs in the sunroom. Frequently I'll rearrange furniture or rotate artwork within the house to create a mood that insures harmony between the table setting and the space it inhabits. Something interesting in the sugar bowl? The flatware is "American Harmony," a current Oneida pattern. I've begun collecting sets of individual silver-capped crystal salt & pepper shakers. It's nice not to have dinner conversations interrupted by requests to pass the salt! By the way, if the caps (or entire shakers) are silver or silverplated, it's never a good idea to leave salt in them between dinner parties. Since salt is quite corrosive, it can cause pitting, plate loss, and other problems over time. The silverplated chargers and trays used as chargers were from estate sales and antiques malls. The crystal salt & pepper set in the dining room is by Mikasa. Flatware is Gorham's La Scala. Pale green napkins and silverplated napkin rings were estate sale finds. 2. Instead of grasping napkin in the center, lift it from midway between the outer corner and the center. 3. Fold the shorter side under and wrap sides toward the back. 4. Slide it in the napking ring. The original center fold will be hidden under the ring. Thank you to Susan of Between Naps on the Porch for hosting Tablescape Thursdays. 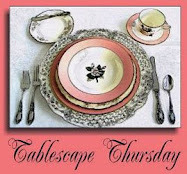 Because of Susan, Blogland now has a tablescaping community. Because of Michael Lee of Designs by Gollum, we know how useful, versatile, and beautiful basic white dishes can be. Whether it's Gollum's ubiquitous Gibson Claremont pattern, JC Penney's basketweave (thrifted or not), the more upscale Mikasa Countryside Italian, or one of Susan's favorites, Lenox Butler's Pantry ... there could (and I think, should) be a set of dress-em-up/dress-em-down white dishes in everyone's home. They're the "little black dress" of tabletop design! I hope you all have a great week! Thank you for stopping by. P.S. No assigned seating today! Which table would you choose if you were a guest -- dressy dogwood white or whimsical peony pink? Gorgeous Bill and what a find!! With all your stunning accoutrements, your affordable white china looks very chic and elegant. I love it. Man, even when you find a DEAL for fifteen bucks, you STILL make it look like a MILLION bucks! You just have the gift, my dear Bill. This is just gorgeous -- both tablescapes. You know I love all the silver, and that new set of dishes truly does look so expensive. I would pick the "dressy" table to sit at, thank you! P.S. Oh, and thanks for the tip about removing salt from any shaker with silver or silverplate. I never knew that. PS Did you know that like Carol and I there is a problem with your photograph on your blog button, something to do with photobucket? congratulation to this find. I love the first table best. The white plates, silver and the dogwood flowers against the dark wooden table are really great. Although white plates often tend to look clinically, yours are looking much better with the relief border, alive through the play of light and shadow. The dogwood flowers look like a modern painting. Do you change the unholstery with the plates? Or is it just fortuity that they match perfect in white. Your pink table is very nice, too. Thank you so much for showing us always the tales of thousend and one possibilities to make a perfect table. wow -- this week it's a "twofer"!!!! Great tables both and beautiful dishes and I can't believe you got the whole thing for $15!!! How COULD you pass it up!!! Absolutely beautiful. I love the new and the old together. Blogger is being bad. Your button is not showing on my sidebar and mine is not showing on Jackie's. Your photographs of these settings are spectacular. What a find! And how beautifully you showed off the thrifted dishes! The dogwood branches make a stunning centerpiece. I so wish dogwoods liked the soil in our area! I am getting worried about you Bill. We may just find you under a huge pile of dishes one day because I know you have some storage issues. Be careful. I can't pick a favorite but love seeing the dogwood indoors. We can't cut dogwood here because it is our Provincial flower. Rules against it or something like that. I do like the tall champagne flutes with that long flamingo. Very pretty. Absolutely gorgeous Bill. What a find! I love a white table and this one makes my heart sing! Bill once again you inspire me! I am now on the look out for a set of white dishes. I love this basketweave pattern. Both tables are beautiful. Can I eat at the dogwood table and have dessert with the Flamingos?? So much fun to take basic white and make it sing different songs! looks like you found a "hafta" too. i'd choose the dogwood table...i love all white. but both are wonderful, as always. Simply amazing...so beautful, absolutely everything. I also found a pair of the cute little vintage votive holders that you've used on last weeks & this week's tables. You're a BAD INFLUENCE, MR. BILL!!! and I ♥ ya' for it, too! I would have walked right by them if I hadn't seen how pretty they looked on your tables. Both of these are just breathtaking...fantastic photos, too! I never get tired of seeing how you mix & match & come up with different combinations to entice us every week. Thank you for so much inspiration! I love the last two ictures the most...I'd love a copy of that last picture with the dogwood and the candle..what a gem! Those dishes are simply fabulouse and the price ain't too shabby either. Great job! I would want an invitation to both! I'm greedy that way! :-) The flowering dogwood is the state tree here in Missouri, so I have a natural affinity for it. On the other hand, I am a HUGE fan of peonies! (Do you pronounce it PEE-onee or pee-OH-nee? I confess that I, like Martha Stewart, give it the latter pronunciation.) The pink flamingos are so great!!! They are the perfect touch of whimsy. I love those photos in which the flamingo and flowers are pretty much the only thing in focus. Fabulous!!! I still don't know how you hap upon all these incredible buys. Those dishes are terrific! I tried again stopping in a Goodwill store yesterday. JUNK! Pure junk! I just never have the luck that you do. Or is it skill? I don't know, but I am sure happy for you that you are able to find such great stuff! Both tables are absolutely gorgeous!!! Once again I am blown away by your ~beautiful tablescape~. Something so inexpensive you transformed into a million dollar look. Yes, I can see this displayed in a window at Tiffany's. Bill, your tables are divine! I love both versions, scaled up and scaled down. 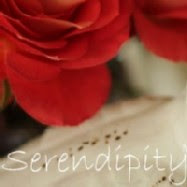 But with you, nothing is scaled down because everything is always perfectly lovely. I adore the dogwood branches, and I adore that crystal you've used on the formal table GORGEOUS. And what a super price those dishes were! I'd say you got quite a deal. It looks a lot like my Wedgwood Nantucket, and I can assure you, I have loved that pattern more than anything. I had other white dishes (plain white porcelain) for many years and white with a gold band for our wedding china, and you are so correct, food looks fabulous on white plates. And these have the added benefit of a textured look. Love them! Currently, I am in love with Mikasa' English Countryside. I've always preferred a geometric look, but something about this has won me over I also like the fact that it's a shade off from my other white dishes. More of an ivory white. And I love Italian Countryside, too. I bought two plates in that recently just for fun. Boy!...you know how to make a gorgeous elegant table even with a beautiful burgain like this, because, of course, I'm sure originally this pretty dishes were not meant to be $15!!! I'm sooo gelous!!! All the details and flowers are so beautiful, and yes, white allows you to dress it up, or down. Great job Bill. Amazing how you made the simple white china look exquisite...in both rooms. I love the dogwood blossoms! Absolutely stunning. What stunning tables you have created! Since I'm a sucker for dogwood (it doesn't grow here, insert very sad face), I'd have to choose to get all gussied up to sit at the fabulous table in the dining room. But then I'd sneak over to the table in the sunroom just to gaze longingly at the azaleas! Your photographs are dreamy and evoke the style of each table perfectly. Congratulations on such a great find. I couldn't have passed them up either. Thanks again for showing us how to turn out perfect tables with classic dishes! Just beautiful!! I love the versatility of white dishes myself....and how could anyone pass up such a deal?! I love to see simple white with a texture because they have such depth; even if some people might call them 'plain', they are anything but!! I think it's also important to try and incorporate as many of the senses as possible when entertaining; sight, smell, taste, hearing AND touch! I really like your white basketweave dishes. They truly are SO versatile. Now, I've been a diehard fan of peonies for as long as I can remember, but that dogwood arrangement is just beautiful! It's so elegant and artistic. Once again, your tables are lovely, and I love the whimsical touch of the pink flamingo. I've been following your posts, even though I haven't done a tablescape in about six weeks. Life got really hectic around here all of a sudden. We went to Nashville for a wedding at the Hermitage a few weeks ago. Do you live near Nashville? What a fun town! Please stop by and see my tablescape if you have a chance. I FINALLY managed to get another one done. BILL! Oh, how I have missed stopping by. These tables with the plethora of white (you sly devil getting such a great deal--they easily could pass for fine bone china! )are divine. I am enthralled with the sculptural quality of the dogwood branches, too. I will have to catch up as I'm sure everything you've posted the past few weeks I've been offline are to die for. I do think you would love the garden of our little tiny yellow Casa Maria, though, so I hope you can stop by soon. Thank you for the continued inspiration. Well, first I will eat with the dogwoods, and then I will go have a cupcake ;) in the den. You got a wonderful buy, love the texture. Both tables are delightful! Bill.....you little thrift master, you!!! I've been contemplating a white with dogwood table, too, but you've done it soooo well that I think I'll leave well enough alone. The white is so perfect on the bare wood table. I just love it! I'll choose to sit with the dogwood, if you please! Wow!! What a find that was Bill!!! I absolutely love white dishes and all the possibilities they have. Hope I find a deal like this one day, I desperately need new dishes. Fabulous, as always. I love both table settings and the photos are beautiful. I especially love the last one. Perfect! Re the white dishes: agreed. I need to pull mine out again! Beautiful as always. Bill, you are one lucky guy! Can't believe you got a new set of dishes for $15!! White dishes are so versatile. I have Mikasa French Countryside and I can use them with so many different linens (even though they are creamy white, not pristine white). I have really enjoyed using them. My choice is the more formal dogwood table. I love the flatware and other silver accoutrements. Another beautiful post! I miss you when you are away! Hi Bill~ ~ ~I'll have a seat with the dogwoods please. Thank you, Oh pink champagne is so festive. I love stopping by for a visit. What a great find and such a bargain. You're a master at putting together a great table. Well done and very inspirational. How can I choose? Both tables are so breathtakig! I would choose to sit at your table and we could have a good chat about your dishes, your table designs, your flowers. I bet it would be a very interesting evening! The dogwood you cut for your table is a perfect match for those incredible dishes. As always I need several visits to take in all the grand element you have on your tables. I am struck with the champagne flutes on the casual table. Gorgeous! And thanks for the tip about making a fuller napkin. I'll use this for sure! Holy Moly! Look what you've done with $20 worth of dishes as a base. I was smiling all the way through your blog. Love the way you write. Glad to know there are others out there he can't seem to quit buying dishes. Loves the touch of flamingos to your scapes. and the dogwood branches, I'll be copying that one Love it all. I enjoy it when you do two tables...both beautiful. I would choose the whimsical table, it is more me...plus I love peonies! Well what a score those dishes are!! Congratulations. I have to admit to being just a tad jealous. ;0) Beautiful tables, Bill. LOVE the dogwood centerpiece. I'm back to ogle your tables again, Bill, and I forgot to answer your question. I'd happily sit at either, but I want to sit next to YOU! Deal? I'm also back to issue a challenge, well sort of. I plan to lose some weight, and when I get to said goal (which might take months! ), then I will go dance at Best Buy if you will. Just think, you have months in which to practice, and you said it yourself, you were the Dicso King back in the day. So, I think we should all get in shape and boogie down at Best Buy. I think we can top that guy! My, oh, my... those dogwoods are amazing. You do good work! It is so hard to chose which table is my favorite! I do love the flamingos though and the whimsy they add to the setting. I don't get to visit often but when I do drop by I am always amazed at how complete and perfect your settings are. This is such a wonderful calming post for me after a hectic, frustrating week or work. Plus it makes me want to thrift shop with you! Just watch out, on my next trip to Tennessee you may see a strange woman lurking in all of the thrift stores! You are a master at bargain shopping......really! I thought I did a fairly good job at locating great pieces at fabulous prices, but I cannot compete with you ability to snif out a good sale!!! And I could never consider being in the same league as you when it comes to tablescapes!! You never cease to amaze me with your gorgeous and elegant tables! Both are gorgeous as usual. I am definately the dogwood table girl!! You find the most beautiful pieces...love those chargers! Both a beautifully elegant table and a wonderfully whimsical table using the same thrifted dishes! Bravo! I do love the tray chargers and have started to create my own collection of them. The Fostoria Holly looks sparkling and lovely. I am also a fan of the dogwood centerpiece. The pink flamingoes are great! Love the way they help to set the casual mood of this table. I agree with you about white dishes being the little black dress of tablescaping. This is what I share with any of my friends who are interested in tablescaping. Find some white dishes and don't pay too much for them. Thanks for the napkin tip, too! The perfect whites! Gorgeous settings Bill! A $15.00 box of dishes elevated to such an elegant status in your hands! They look amazing in this setting. I also have this pattern (mine we $20.00 for the box at Marshalls - LOL) however I always used them in a more casual settting. You've opened my eyes! Just lovely. I tell you what, you may have only paid 15.00 for this beautiful set of dishes, but you made them look like a million bucks for sure. I love, Love, LOVE this table setting. Bill the addition of the pink flowers and pink flamingos is just blowing my mind. What a genius combination. It works so beautifully, and they look as if though are stretching out in a seriously beautiful white garden. Just one time in my lifetime, I would so love to set at your table of GENIUS. Your mind must be going non stop all the time, when you see dishes, you are creating right there in the store, estate sale or where ever you are. I just know it. What lovely place settings! And the dogwood is divine. My senior mom loves that her gardening gets to include our Dogwood tree each spring! I love both tablescapes - perfect for company or holiday dining, but the simpler set with the pink flowers and the lovely dinnerware would probably be my first choice since I'd be entertaining the grandchildren :) Thank you for a lovely Pink Saturday visit. So beautiful, Bill! I just love seeing how you used these dishes. Amazing, as always! I am so taken with white dishes - I have four different sets. I think they always look good - dressed up or dressed down. Lovely! HI BILL! I noticed that you joined my team blog NOWHERE...I just thought I would come to visit you. OMG you have a beautiful home and exquisite taste! Thank you for coming by to join. We are silly in Nowhere, but if you wish, come see me at CASTLES CROWNS AND COTTAGES! Your tables always look lovely, and these are gorgeous. I love that you used your dogwood and your azaleas. Absolutely exquisite. Bill, I'm late arriving so I hope there's still a place at the "dressy dogwood white" table. This is a gorgeous table, but I say that about all your tables. The Penny's basketweave china reminds me of our own Wedgewood Nantucket Basket. I agree, everyone needs at least one set of white china. I love the dogwood centerpiece! Breathtaking!! Ahhhh you have taught me a lovely lesson!!! A few weeks ago, I found a set of those dishes on sale. We were desparate for dishes that would go in the microwave (most of our dishes are vintage or antique and our adopted niece and nephew are NOT). I like the dishes, but after your lesson, I may decide that I LOVE the dishes!! Love the dogwoods. I love how wild tree branches with blossoms are on display. Thrift Meets Limoges, with Bunnies!